6 Tips to capture great “Point of View” video in your smartphone qualitative project. Smartphone qualitative is an amazing tool to let you see your participants’ lives from their point of view. Sometimes that means riding along on their smartphone and having them video key moments of their daily lives. But never fear! By using the right approach and special tools, you can capture true point of view video of just about any activity - even the tricky two-handed ones. Provide your participants with a point of view smartphone holder to make the task easy. We tested out all of the available point of view smartphone holders we could find to see which ones are best for smartphone qualitative. Our reviews, recommendations and explanations can be found here. Choose a point of view smartphone holder that lets your participants see what they’re recording, and gives them easy access to the screen and buttons on their smartphone. Being able to see what they’re recording and see the instructions you’re giving them is crucial to capturing what you want to see and makes the experience far easier for participants. Carefully consider what you want to capture, and what angle you want to see it from. Some smartphone holders hold the smartphone up higher for a “bird’s-eye” view, others capture from closer to the participant’s eye level. Usually devices that hold the smartphone a little below the participant’s eye level get a better view of what’s going on and capture clearer, more stable video. Good point of view smartphone holders are reasonably cheap, so choose a seller who will let you order holders and ship them directly to your participants for you. In our experience, it’s easier to let participants keep the holders after rather than coordinating their return. Ensure that you include a quick tutorial assignment that shows your participants how you want them to set up their point of view smartphone holder. The set-up of a point of view smartphone holder isn’t difficult, but getting your participants set up correctly makes it easier for them and will get you dramatically better-looking videos. Carefully think through how you’ll walk your participants through the process of capturing point of view video. Tools that walk participants through activities with screen-by-screen instructions make it easy for your participants to capture exactly what you’re looking for without getting confused of frustrated. Here's an example of a point of view video capture done with the Over the Shoulder app and a "Neck Rig" allowing the participant to unload their dishwasher using both hands, and capture the action. In this case, we've stripped out the audio, but your participants can "narrate" what they're doing and how they're feeling about the process as they capture video. Want to include your audience’s actually point of view to your project? Give us a call, we’ve got experienced teams of project designers and project managers that would be happy to help! Smartphone qualitative is an amazing tool to let you see your participants’ lives from their point of view. Sometimes that means riding along on their smartphone and having them video key moments of their daily lives. Other times, “point of view” is meant literally. Recently, more and more of our users have been using Over the Shoulder to capture the literal point of view of their participants. For example, a company that makes easy-to-prepare meals wanted to witness their customers actually using their product in their kitchens, or, a company that makes cleaning products who wanted to see how someone actually uses their product to clean their toilets and bathrooms. This kind of literal point of view capture is already easy to do using the Over the Shoulder app, unless...the activity you want to see your audience do requires both hands. Two-handed activities mean participants won’t be able to hold their smartphone in one hand and do the activity you want to witness with the other. Our recommended device: The "Neck Rig"
In our test, the clear winner was the Neck Rig, which won across all evaluation criteria and is the best choice for most point of view video use cases. Video capture quality: The Neck Rig holds the participant’s phone below their chin so that you get a great point of view angle. It’s as close to eye-level as possible without obstructing the subject’s view, and the rig holds the smartphone up high enough that it stays out of the way when participants are moving their hands performing the task. The Neck Rig also holds the smartphone steady enough to capture video without appearing “jumpy” or hard to view. In the tests where the participant wore more than one rig simultaneously while doing a task, the Neck Rig was much more likely to capture the best vantage point of the action. Because it’s worn around the neck, it usually captured the best video when the subject looked up or down and even side to side, with the rig shifting slightly as the participant moved to keep the action in the video frame. Result: even tasks like a diaper change or laundry sorting where participants are looking up and down or side to side were more likely to be captured. In addition to capturing great video, this rig also captured the best audio because the smartphone was held close to the subject’s mouth. Usability: The Neck Rig was the most comfortable to wear as reported by participants. Another crucial usability advantage the Neck Rig has is that it can be set up so that it holds the screen is facing in to the participant. That brings with it two crucial advantages: 1) the rear-facing (and typically higher resolution) camera does the recording and equally important 2) the participant can look down and know that they’ve successfully tapped the “record” button to start the recording and can ensure that they’re actually capturing the action in the video. That may sound trivial, but for our testers, it was a huge ease-of-use advantage because they didn’t have to worry that they would miss recording the action and have to repeat the task or submit an incomplete assignment. Note: Most Neck Rigs do not come with very good setup instructions, so we've built a special Over the Shoulder assignment that walks participants through the setup process step-by-step to ensure participants can enjoy the usability benefits mentioned previously. Cost/practicality: Neck Rigs are also inexpensive, though not “cheap feeling” and easy to send to participants via Amazon.com. Participants reported that the rig felt like held their smartphone securely enough that they didn’t fear having their smartphone drop out of the holder during use, but didn’t use a sticker. The right Neck Rig also fit all of the different device types we tested it with. The povie is Great product overall, but it has a few specific features that make it less than ideal for qualitative research (at least the types of projects we see most often). Video capture quality: The POVIE holds the participant’s smartphone in roughly the same position as other Neck Rigs, so it’s just about ideal in terms of video capture quality. Usability: The POVIE rig was comparably comfortable and benefitted from the same ability to hold the participant’s smartphone in such a way that the participant can see what they’re recording as they record it. The POVIE is probably the best-designed of the holders we tested, sturdier than other Neck Rigs and simple to set up. The big knock on the POVIE is that current models require the participant to stick an adhesive magnetic disk to their smartphone to connect it to the POVIE unit. This magnetic connection holds the phone securely, but our testers didn’t like that they had to stick something to their smartphone, and worried that the magnetic attachment disk would get in the way of regular phone use or leave a mark on their phone when removed after the project. Cost/practicality: The POVIE is currently available for $49.99 from a handful of online retailers. That price includes free expedited shipping, but it may be cost-prohibitive for many projects given the existence of a cheaper alternative. The "Chest Rig" that we tested is another good choice with great video stability, but some usability downsides. Video capture quality: Chest Rigs hold the participant's phone on the top third of their chest giving you a point of view from below the participant's eye level. The beefy straps and solid hardware included in most Chest Rigs hold the rig tightly into the participants chest which typically results in a relatively stable platform and nice, stable video. The only downside in terms of video capture is that the Chest Rig has the least ability to keep what the participant is looking at in view. Unlike a Neck Rig, which turns slightly as the participant turns their head and keeps the subject in view, the Chest Rig will capture what's directly in front of your participant even if they are looking to either side. Usability: Chest Rigs are a little tougher for participants to put on than Neck Rigs. Some body types are awkward to fit into a Chest Rig, and the process of putting on the rig takes a few minutes. Cost/practicality: Chest Rigs are in the middle of the pack for price (typically about $25 a unit for decent quality) so they're feasible, but overall they don't give many benefits that you don't get with a cheaper, easier-to-put-on Neck Rig. Hat rigs have some specific positives in terms of tracking directly with where participants are looking and ensuring on-subject video, but some significant drawbacks as well. Video capture quality: The hat rigs we tried got mixed reviews in terms of actual video quality. On the positive side, a hat rig holds the smartphone at forehead level on a hat that’s included with the rig. That means that the camera directly tracks in the direction the participant is looking, so video is captured even if they change what they’re looking at throughout the capture. On the negative side, hat rigs don’t allow the participant to see what they are videoing during capture, and are clumsy for participants to use. Video quality is compromised on all the hat rigs we tested because between the loose fit of the hat to the participants’ head and the bendiness of the holder itself, significant movement of the smartphone was common. Usability: Hat rigs have some significant usability problems. Some of our testers felt self-conscious wearing the hat rig and felt as if the rigs were “wobbly” and could fall off, potentially dropping their smartphone. The weight of the smartphone plus the rig was also noted by many testers as distracting. Cost/practicality: Hat rigs typically cost about $25-$50 and are widely available online for delivery to participants. Lanyard rigs are cheap and simple, but we haven’t found one that’s well-suited to helping participants capture point of view video. Lanyard rigs hang over the participant’s neck, so they have a tendency to flip backwards during video capture and miss the shot. The lanyard holders can sometimes inadvertently cover the microphone port on the smartphone compromising audio quality. Even when they stay facing the right direction they tend to produce video that’s frequently not on-subject and/or shaky because the lanyard is allowing the participant’s smartphone to “swing” rather than holding it firmly to their body. One overall learning from our testing is that getting great point-of-view video isn’t just about choosing the right rig for the right task. You also need to walk participants through the process of receiving and setting up the rig correctly to ensure they have a good experience and you get the great video you want. We discovered that a specific “TAP THIS ASSIGNMENT WHEN YOU RECEIVE YOUR RIG” button with a full walkthrough of the setup process is essential to successful capture. Have you got a favorite technique or a product we don’t know of that’s great at enabling point of view video capture in market research projects? We’d love to hear about it in the comments section! 12 crucial tips to designing smartphone qualitative that gets great insight. Over the Shoulder has been helping put smartphone-based qualitative into the toolkit of qual researchers and insight seekers for almost nine years now. We’re often asked by clients to list the biggest tips and “watch-outs” that smartphone qual practitioners should bear in mind to make their jobs easier and their deliverables to clients more valuable. So we put the question to our in-house team of smartphone qualitative designers and turned their years of experience into the list of 12 crucial tips below. Design your project to be entertaining and engaging. Great smartphone qualitative leverages the intimacy people have with their smartphones, and the enjoyment participants get out of telling their stories and sharing their truths. Your study design should always reflect this. So “de-formalize” and “conversationalize” your language. “Gamify” your assignments. Fill your study with “Easter Egg” questions that provide moments of levity and little emotional rewards. Use a platform that lets you set up logic to give realtime acknowledgement to your participants. For example, if you as a participant to rate their test-drive experience from "Amazing" to "Disappointing" and they chose "Disappointing," following up with "Oh no! What do you mean when you say 'Disappointing'?" It makes participants feel like they're engaging with someone who really wants to hear what they have to say, not a machine. Use emoticons to let participants express themselves, and use them in your design for standout, visual appeal and clarity. If you include scales, remember that rating the moment you’ve just experienced on a scale of “Best time ever” through “Major bummer” is more fun and conducive to emotional disclosure than rating it on a scale of “1-7, with 7 being extremely enjoyable.” Just about any project can be designed to be engaging to interact with, and the insights you get back get better when your project is entertaining and fun to be part of. Ask only the most important questions, and as few of them as possible. The biggest surprise our first-time clients get is the sheer volume of response you get from a project. And that’s great, as long as you’ve been disciplined in your design, and kept the number of audio and video recordings you ask for to a reasonable level. But if you ask too many audio and video questions, you’ll be awash in media response, and all the time we spend building tools to make your analysis more efficient will be powerless to help you. Asking for too much is the number one mistake first-time practitioners make and it can simultaneously kill your project profitability and annoy your participants while adding nothing to the insightfulness of your project. The right sample is the smallest one possible. Again, smartphone qualitative produces a large quantity of rich photo, audio, video and other data. Keeping your sample as small as possible reduces the amount of data you'll need to analyze. Most studies don't need more than 20-30 carefully-selected, engaged participants to produce great insight. Our "rule of thumb" is that each segment of your sample that you want to be able to understand and isolate from the others should have about 15 participants in it. 15 participants typically gets you to the feeling of "saturation" (where you start hearing the same themes and stories repeatedly, and the number of new ideas diminishes quickly). Choose a study length that lets you see a proper window into the behaviors you want to understand. Smartphone qualitative projects can be as long or as short as needed. We've helped clients do everything from single-day projects to ones where they participate in journaling for over a year (!). Keep your study period as short as possible (more study days = more data to go through). Design your study so that it's long enough to let you see the relevant behaviors you want to understand. For example, if you want to understand daily snacking behavior, be sure to include weekdays and weekends, as behaviors tend to vary between the two. Remember that your participants DON'T have to be doing assignments every day. If you want to understand how they find recipes, shop and prepare new foods, you can design your study length so that it spans they typical length of the behavioral cycle you want to observe. If your consumers typically do the "inspiration-preparation-serve & reaction" cycle over the course of 2 weeks, that's a good study length. You may not need your participants to be answering assignments every day over the whole two weeks. You can give them "rest days" and let them journal the behaviors as they naturally unfold. There's often no need to make up a daily assignment to understand a weekly behavior. Always participate in an on-device test of your project before you launch it. Seriously. We never let a study we've designed and built for a client go into the field without its designer going through it on their own smartphone. Even our most experienced Project Designers, who have designed hundreds of smartphone qualitative projects for our clients, will tell you they almost invariably learn something that can make the participant experience better and the project more successful. Walking through your project on your smartphone will instantly reveal if you’ve broken #1 or #2. Plus, knowing what it feels like to be on the receiving end of your assignments journals and questions is always good practice. Make participating easy for your participants. Always make it clear to participants where they are in your study and what's coming up. Tell them how long the assignment they're about to to start is going to take them (and never underestimate it). If you have people journaling their "joys and frustrations" in the moment, make sure your journaling assignment takes 60 seconds or less from opening it to hitting "submit" and don't make them wait while their answers upload. You'll be amazed how many more moments you capture, and the quality of those moments. Use logic and skip patterns so that participants never have to "forward through" questions that aren't relevant to them. Be incredibly clear on when projects start and end. Our rule of thumb is that any important project detail needs to be communicated three times to avoid confusion. Participants should be able to get back to an explanation of the rules, dates and expectations of your project right within the app at any time. Ensure that you're clear up front (at the recruiting stage) exactly how much time participating in your project is going to take. Avoid extending studies past their original finish dates, and if you have to extend them, offer bonus incentives. Few things irritate participants more than "adding on a few extra assignments" that will require them to continue participating after the date you told them they'd be finished. Choose response media so that participants can easily and comfortably express themselves. One of the most exciting things about smartphone qualitative is obviously the ability to submit beautiful "selfie" videos in answer to your questions. And there's no doubt that a great in-the-moment HD video can be an insightful showstopper in a presentation. But video isn't the right capture medium in all situations. For example, if you've sent your hemorhoid-suffering participants into the drug store to survey the shelves and tell you about the product that's most relevant to them and why, asking for a selfie video will make them uncomfortable (or should we say "even more uncomfortable"). But they can easily take a photo of the product, then hold their phone up to their ear (feigning a phone call) and tell you about their inner monolog in an audio recording. You'll get far better insights for it, not to mention better compliance. More on choosing the right media can be found in "In praise of audio recordings." Review your results while your study is live, and ask follow-up questions. The beauty of good smartphone qualitative lies in its interactivity and flexibility. A good smartphone qual platform will let you know the instant participants submit responses and let you send them individual probes and follow-up questions when you need to. Over the Shoulder not only lets you send probes and follow-ups, it even lets you ask for responses in ANY media you choose. We recommend you or someone on your team dedicate a block of time each day during your fieldwork so that you can take advantage of the opportunity. Someone will need to go through your participants’ submissions regardless: that someone may as well be doing it in real time so that they can take advantage of the ability to probe individuals and get to deeper layers of insight. Another important advantage of working in “real time” with your project (or having a Community Manager who does it for you) is how motivating it is to your participants. Remember, participating in a smartphone research project feels, well, weird at first for participants. Imagine yourself sending your personal thoughts off into the ether as photos, text, audio and video recordings, and wondering if anyone’s even looking at them on the other side. Giving individual participants a push notification addressing them by name and telling them that they're doing a great job is extremely engaging and will get you better insight. And it’s something that we can say with authority will increase engagement with your project and the quality of the response you get. Same goes for participants who aren’t performing up to grade. An artful prod from a Community Manager can often turn a marginal participant into a superstar and avoid dropout and replacement costs and delays. Getting the right participants into your project takes effort, planning and money. But unlike online quant and even some online qual, the audios and videos smartphone qualitative generates will reveal a poor recruit immediately. Find a good recruiting partner (we're happy to help), pay a motivating incentive, and manage your participant community actively (if you'd like Over the Shoulder can assign an internal Community Manager to your project to ensure this happens). Some of our practitioners even schedule a 10-minute live intro call with each participant at the beginning of the project to get them warmed up, comfortable and engaged before they download the app and start participating. Pay participants an incentive that makes it worth their time to engage fully with your project (we recommend paying roughly the same per-hour rate that you’d pay for face-to-face qualitative). The recruiting and incentive tab for your job may be a little higher, but so will the engagement with your study and the value of the insights it lets you bring your client. Replacing bad participants and chasing down participants who are not fully engaged will end up costing you more than having a compelling incentive and well-screened participants in the first place, as well as keeping your project on schedule. “Pay peanuts, get monkeys” definitely applies here. Have an analysis plan, and design your study to make analysis easier and efficient. You should ensure that you’re familiar with the tools you’ll be using to monitor and analyze your results well before the submissions from your participants start rolling in. If you’re using a new platform, or its your first smartphone qual project, make sure you're totally comfortable using it BEFORE your responses roll in. We actually set new clients up with access to a “demo” Project Viewing Portal so that we can make sure they’re up to speed with how it works, and the analysis tools they’ll be using before their fieldwork starts. And, we make sure that they have an analysis plan specifically based on their project’s design so they know what they'll be doing with the answers to all of the questions and assignments before the project even starts. Make your project entertaining and engaging for your clients. Remember that your clients are giving up the "focus group ritual" when you use smartphone qualitative. The "back room chatter" and the group focus that comes with it are a valuable part of the face-to-face research process. Happily, good smartphone qualitative platforms offer lots of ways to rally your key clients around the project and engage them with it so that they get great value out of it. Try "daily reports" with key submissions. "Buddy up" key clients with a research participant and make it easy for them to see their buddy participant's responses as they come in. Even let them ask follow-up questions and probes (with you as editor and controller) so that they feel involved and learn as the project unfolds. Use your "ripped from reality" photos, audios and videos to make a powerful presentation. Even use tools like online media collages that let your clients share and access key participant submissions long after the project is over. Respect the privacy of your participants. In many studies, we're asking participants to capture and share moments that are intensely private. So, it's crucial to be good guardians of the secrets of people who participate in studies. Ensure you're using a system that actively protects participant's identifiable information and everything they submit. If your research subject is intensely private, ensure you're working in a system that can keep participant identities entirely separate from what they submit. If a submission looks so great that you can't resist using it outside of the project that collected it, make sure you can get the participant's explicit permission to use it. We find that most participants are happy to have their submissions shared if they can review what's going to be shared, and the exact way their submissions will be used. We've built technological, operational and organizational security at the highest level right in to the Over the Shoulder platform so that we can keep people's secrets safe, and help you make sure you're using their submissions appropriately and respectfully. Smartphone-based qualitative as a methodology is growing rapidly. But as market researchers, we’re still learning a great deal about the best way to get great insight from participants. As an example, take the decision of whether to ask participants to respond using video or audio. Capturing video from consumers through their smartphones is an amazing tool. In-the-moment consumer videos are rich, visually powerful, and a great way to tell a story and make a point. That’s why high-quality video is a core component of the Over the Shoulder platform, and a centerpiece of virtually every project our researcher-clients conduct. But in many cases, the power of video overshadows another very powerful way for participants to express their thoughts and feelings: good old audio recording. Recording an audio elicits a different feeling compared to recording a video. Try it yourself. Go to your smartphone's video camera, and make a “selfie” recording telling me about something that annoys you. How did you feel doing that? For most people, the answer is “I feel a little self-conscious and maybe a little distracted.” You have to look at yourself talking, which many people don’t really like to do. Did you fix your hair or adjust your appearance before you hit “record?” That feeling of self-consciousness can get in the way of your ability to let your thoughts flow freely. Now make an audio recording telling me about something that’s annoyed you at some point today. Did it feel different? You may have noticed that your thoughts flowed more freely as you recorded your audio. And that free-form thinking is extremely valuable in smartphone qualitative. So when is audio preferable to video? We sometimes counsel the researchers who use the Over the Shoulder platform to “use audio responses to get depth of understand of your consumer, and video when you want to be able to make a point in a presentation.” It’s not that video isn’t great, it’s simply that in many situations, audio recordings get a more free-flowing, unedited response from participants. Beyond getting more free-flowing responses, allowing your participants to respond with audio recordings has other big benefits. Imagine you’ve got participants journaling a visit to the drug store. You’ve got them standing in front of the shelf, viewing all of the hemorrhoid remedies they could choose, and you want to understand what products are connecting with them and communicating something relevant. You could ask them to record a selfie video explaining their thinking, but you shouldn’t expect great a response. But if you prime your participants to answer the question with an audio recording and suggest they hold their phone up to their ear like they’re quietly talking on the phone, you’ve created a situation where they can much more comfortably share what’s going on in their heads, This will lead to responses that are free from embarrassment and self-censorship, and that means great insights for you. Here’s another example: say you want participants to share their thoughts first thing in the morning, before they get out of bed. Or you want them to talk about their post-shower routine. You can ask for a video, but you’re unlikely to get it. But if you ask for an audio recording, participants don’t have to worry about their bed-head or appearing naked in a video. They can easily express themselves in an audio recording, and you can get their true in-the-moment thoughts and emotions. And what do participants think and feel about audio? With all of the benefits of allowing research participants to answer questions with audio recordings, it’s a wonder why the vast majority of smartphone qualitative platforms don’t include audio recordings as an option. The answer is that enabling audio recording across Android and iOS devices is technically difficult. But at Over the Shoulder, our devotion to making it easy to be a participant, and making it easy for participants to express themselves freely drove us to figure out a way to ensure that audio recordings are always an option. So, the next time you’re designing a smartphone qualitative project, bear in mind that an audio recording may be the best way to capture in-the-moment thoughts and emotions and make sure that you’re using a platform that makes recording audios easy for participants. The Over the Shoulder team has spent the better part of a decade building and honing the Over the Shoulder smartphone qualitative platform and helping qualitative research moderators & practitioners use it to do industry-leading insight work. Along the way, we’ve fielded a lot of questions that qual practitioners wonder about. So, we decided to start posting common questions and answers to them as a resource for everyone who wants to learn about smartphone qualitative, understand their options, and be inspired by the opportunities. Please feel free to build, comment or post additional questions. We’ll try to update this blog at least weekly. We hope you’ll find it helpful and inspiring! - The Over the Shoulder team. Can I use smartphone qualitative as part of a project that includes other methodologies like focus groups or live virtual interviews? Smartphone qualitative prior live sessions (in home, in facility, virtual, etc.). You might start your project with 60 participants doing a week of smartphone qualitative where they do things like share their home life, work life, usage occasions, or even visit a store to purchase and try a product. Participants submit assignments throughout the week, and you can review their video submissions, then select the best, most representative 20 participants to schedule live sessions with. It’s an amazing design that lets you get in-the-moment insight from 60 people, review and think through their submissions and be prepared to “go deep” in your live sessions. You can even show participants things they’ve submitted in the moment to spur their recall and lead to deep exploration in person. Gather in-the-moment insights through the Over the Shoulder app. Send them on “buy & try” missions, where they'll locate and purchase specific products in their local retailer (or purchase them online), try them out in their home, and complete assignments that let you see everything from their in-store experience, purchase experience, and the moment they prepared and used the product in real0life situations. Have them journal key moments based on your live discussion. Send individual follow-up questions to participants based on what they've talked about in your live sessions. Send a few questions that participants might have been too worn out or socially constrained from giving you an answer in your group sessions. You can even select the best participants in your focus groups/interviews and invite only them to do a smartphone-based follow-up study. We’re happy to help make it all come off smoothly. Add smartphone-based pre-work/homework to your live sessions. It’s easy to have your participants start your project with smartphone-based homework that they’ll complete before they come to your live sessions. Have them journal their snacking behavior, buy and try a few products, or have them share their personal story before you meet them face-to-face. There are plenty more great ways to combine methodologies to get more insight and compelling “ripped from real-life” media to help tell a compelling story. As always, we’re happy to hear your ideas for hybrid projects and help you find a great design to deliver your objectives. How should I be thinking about timelines for my smartphone qualitative project? How long does recruiting take? How long should I leave for the project design & project programming process? 3 weeks is ideal. 3 weeks from commissioning your project to the start of your fieldwork gives you enough time for just about any recruit, it allows plenty of time to come up with a great design, get input from your clients throughout the process, and it gives OTS ample time to get your study programmed, tested and ready for the field. The 3-week timeline gives everyone involved enough time to thoroughly and meticulously think through your project and not feel rushed. 2 weeks is comfortable as long as your recruit is standard. 1 week is doable if you can get input and approvals on your design quickly and your recruit is not too challenging. Some studies can be put together and recruited in less than a week, but it’s probably going to feel rushed. The big driver of your timeline is usually how long it will take to do your recruit. While a small study (20-30 participants) with wide recruiting specs can often be recruited in just a few days, highly specialized recruits can take a few weeks or more. Designing a typical project usually takes about a week including reviews, approvals and adjustments. Programming and testing a project is easy to do 72 hours. Shorter is usually possible, and we’ll always accommodate you if we can. Does Over the Shoulder have a panel? Why? Over the Shoulder does not have a panel. There are a few reasons. First, we committed early to building an open platform that can easily bring in participants from any source so that you have full flexibility to work with any panel provider, recruiting resource and lots of other recruiting approaches. Our mission is to help you do great smartphone qualitative, not sell you our panel. Second, most of our clients need specialized recruits for their projects. We’ve learned through the years that “pre-recruited” smartphone panels just don’t have enough members to allow you to get good participants if you need specific age groups, regions, product usage specs or other recruiting requirements. Third, most pre-recruited smartphone panels have real issues with participant quality, professional respondents and security. Fourth, we respect and rely on our many recruiting partners, and having our own panel would put us in conflict with them. Bottom line, every Over the Shoulder project gets a fresh, carefully screened, managed sample of exactly the participants you need. It takes a little longer and costs a little more, but experience has taught us that it gets you far better results and far fewer hassles. Can Over the Shoulder do my recruiting for me? Over the Shoulder has partnerships with recruiters that we can work with to get you high-quality, engaged participants for your project. We know which recruiters we can rely on to get exactly the right people into your project as quickly and cost-effectively as possible. If you’d like, we’ll even manage the process, write your recruitment screener, interact with your recruiter on your behalf to replace dropouts and include recruiting & incentives one simple invoice for you. On the other hand, if you have a recruiting partner you love and you’d like to work with, that’s great too! We’re happy to work with them to make your project go smoothly. We have support materials at the ready to help any recruiter be a great smartphone qual recruiter, and your Over the Shoulder project team will happily interact with any recruiting partner you choose to make your project successful. And, if you have a panel of participants already, we can easily onboard them into your Over the Shoulder project. I know my objectives and my insight needs, but I’m not sure that I can (or want to) figure out how to design a smartphone qualitative project. Can Over the Shoulder help me with that? Of course! Over the Shoulder is proud to employ the best smartphone project designers in the business. Our average project designer has 6.5 years of experience designing smartphone qualitative (not bad considering smartphone qualitative has only been around for about 9 years!) and hundreds of projects under their belt. It’s the easy way to a killer design. You start by sharing your objectives, insight needs and ideas for your project with your Project Designer. Your Project Designer carefully listens to what you’re trying to learn, and puts together an outline of how to answer your objectives, applying everything they know about the Over the Shoulder system, and proposes an outline for your design. You review it, shape it, add your thoughts and ideas, and when you love the outline, your Project Designer drafts a question-by-question, prompt-by-prompt smartphone discussion guide for you. Review it, get feedback and approvals, and presto…you have a great design every time. Want to have more control and save some money? No problem. We’ll assign you a Project Designer who can run you through the basics, give you some ideas and send you off with our easy-to-use project-building template. You write up your smartphone discussion guide exactly how you want it. Your Project Designer is there to support you, and will review your project to give you any final suggestions and make sure it makes the most out of the platform. If you’re comfortable with the Over the Shoulder platform and smartphone qual design, you can draft up your project in our easy-to-use template. Does Over the Shoulder do analysis, presentation building or do projects directly forend clients? No. Over the Shoulder is here to support qual practitioners, not to compete with them. Early in our history, we used our own platform and provided analysis and reporting to end clients. Now, we focus on developing the world’s best smartphone qual platform and teaching practitioners how to use it. We don’t do analysis, but we’ll provide you with the tools and training to do it yourself. We don’t write reports or give presentations to end clients, but we’re happy to help you look like a rockstar. That keeps us plenty busy, and ensures that the quallies we support never have to worry about us competing with them for projects. Seems fair to us. Eight years ago, Over the Shoulder was a little group of passionate qualitative researchers who saw smartphones becoming popular and got excited about using them to get to fresher, more powerful insight. “Riding along” on the smartphones we knew people would start carrying with them wherever they went seemed like an amazing opportunity to understand their reality better. At the time, there were no other smartphone qualitative research apps, so we designed and built the first one and started using it. We still remember the thrill of seeing these amazing moments of consumer reality come back through the app and lead to new insights and ideas. But to be honest, that first version of the Over the Shoulder app left a great deal to be desired. Why? Because it wasn’t easy for participants to use. Here’s an example: If we wanted to have participants capture a video, we had to ask them to leave the app, go through their home screen, go to their camera, capture the video, return to the app, tap “upload,” then navigate to the video they’d just taken, select it, and then upload it. It could take up to 4 minutes and 22 “screen taps” to capture a one-minute video. Happily, one of the first things we intuitively did as we continued to develop Over the Shoulder was to find ways to make it easier for participants to capture their moments and express themselves. The payoff was immediate and dramatic. Every time we found a way to make capturing a moment take fewer “taps” and less time, we could see that participants pulled out their smartphones more often, and captured more powerful and insightful moments. Our practitioner clients noticed and encouraged us to continue our crusade to achieve the perfect participant user experience. So we doubled down. We dedicated ourselves to figuring out how to remove “friction” wherever it occurred in the app user experience - no matter how minor. We filled notebooks with personal observations. We got serious about collecting and analyzing user feedback. We white-boarded, wireframed, and re-imagined what was possible. And we tested and built the best ideas into the Over the Shoulder app. Over the last 8 years, we conceived of and added 77 significant improvements designed to make our app user experience easier, faster and more intuitive for participants. As a result, participating feels more natural and takes much less time. Participants don’t have to leave the app or wait while a photo, audio or video uploads. Answering a photo, audio or video question happens with dramatically fewer “taps”. Instructions are clearer and more engaging, so participants spend less time futzing with the app, and more time sharing their reality. In short, we maniacally dedicated ourselves to making Over the Shoulder the easiest participant user experience in the business. But why do we even bother? Why does an easy participant user experience make such a big difference? Two big obvious but important factors are at play. First, the moments smartphone qual lets us capture are often short-lived (they’re called moments, after all). Capture these moments and you’ll often find great insight. Use a tool that takes too many seconds or too many screen taps and you’ll miss the moment - you’ll get their post-rationalization, not their reality. A participant can pull out their smartphone and be capturing a video within the Over the Shoulder app in about 6 seconds (or 5 “taps” on their screen). That means they’re often capturing the experiences that lead to insight AS THEY ARE HAPPENING. The “frustration moments” they’re journaling are captured while they are experiencing actual frustration and can “blurt” about it without overthinking. In-the-emotion is often where the insight is found. The second reason we’re maniacal about participant user experience is that people have so little patience for apps that take too much time and mental effort. Market research apps are no exception. Here’s a bit of harsh reality…if you’re interacting with people through an app, people are comparing your user experience to Google, Apple and Instagram. They spend their time with the best-designed apps in the world, and if your app experience doesn’t measure up, you’re annoying them. So it wasn’t good enough for Over the Shoulder to be better than the other smartphone research apps that have followed us into the market. We knew we had to make sharing a moment through Over the Shoulder as easy as updating your Facebook status. But the payoff for getting your participant user experience right is massive. When your app lets people journal a “thirst occasion” for you and it actually takes people 30 seconds to do it, they do it more often and more reliably, and you get better data. Try the same with an app that takes participants 2 or 3 minutes to capture the same data and your participants will skip occasions. When participants can capture a photo, a video and a few key multiple choice or text responses in under 60 seconds, they can do an amazing job of helping you understand the relevant moments of their lives. And they mostly have a great time doing it. If you allow friction in your participant user experience, they won’t engage as well, and you won’t understand as well. So call us obsessed. But it’s in the name of getting better insight. And insight is, after all, why you’re doing research in the first place. Whether English teachers like it or not, emojis are a huge part of how people express themselves today. To get a sense for how fast emojis - which literally means “picture character” in Japanese - are flying on the web, brace yourself as you check out this website that visualizes how frequently each one is used on twitter. And that’s just one source. Another staggering statistic: Swyft Media reported that the world’s 2 billion smartphones shared over 6 billion emoji (or stickers) every day. In 2015. Marketers recognize them as cultural currency and co-opt them. McDonald’s recent campaign is clearly lovin’ em. Their adoption seems set to accelerate even further as major players are actually building tools that enable emoji usage. Facebook has added emoji-based “reactions” as a feature. Smartphone keyboards in iOS and Android have launched a new emoji prediction and replacement feature that make adding them one-touch simple (e.g., tap in the word “happy” and iMessage suggests a 😀). Seen the latest Macbook Pro? Then you know the Touch Bar has effectively added emojis right to the laptop keyboard. It doesn’t take a 🕵🏽 to see that emojis are embedded in our culture, language and vocabulary. BUT WHAT DOES THAT HAVE TO DO WITH QUALITATIVE RESEARCH? In that moment, I realized three things: 1) texting with emojis is an inherent part of communicating on smartphones today, and not just for millennials; 2) compared to written words, emojis are not only quick, easy and fun they’re sometimes a more accurate way to express emotions; and 3) with a little explanation, they reveal a lot about what a person is really thinking and feeling. It wasn’t just my Mom. Around the same time, we started to see participants in the smartphone-based qualitative research projects we helped design and implement use emojis to express themselves instead of responding in text - completely unsolicited... It was just a natural part of how they were responding. With participants using them more and more often, it became clear that ignoring emojis was the equivalent of ignoring the body language of someone during an interview. Projects that make participation fun and easy for consumers get more and better insights. Our entire Over the Shoulder platform is designed around that crucial principle. So, we’re now animating the instructional text in our projects with emojis. It’s a simple way to make projects more engaging, and we’re finding that it’s already producing better insight. 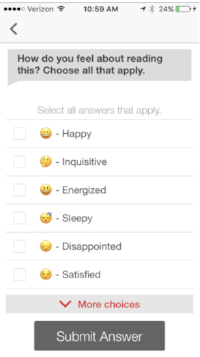 Classic projective tests like the Rorschach and Thematic Apperception Tests work well on good smartphone-based qualitative platforms, but emojis definitely have something to add. It turns out that you can use them to help reveal motivations, needs and associations based on the participant’s free-association, just like the classic projective techniques. Imagine you’re looking to understand a person’s emotional experience with fast food. When consumers use the app to document their in-the-moment occasions, why not have them type a string of emojis that represent how the experience is making them feel, and then explain their emoji selection in a follow-up video or audio response. This simple way of making it engaging and easy for people to express themselves definitely gets more insight than just using plain old words. Sometimes you want to have people select an emotional association from a closed-ended list. How are shoppers feeling during checkout on Black Friday vs. Cyber Monday? Happy, stressed, totally mad? The Over the Shoulder platform lets you add a corresponding emoji next to written words, so people can easily identify and select the emotion that fits their in-the-moment experience the best. We’ll keep you posted as we experiment more with emojis in the smartphone-based projects we help our qualitative practitioner clients develop and execute. What do you think about using emojis in qualitative research? How have you been using them in your work? We'd love a comment or question. Using mobile qualitative to answer big data’s little questions. But if you want to do anything more meaningful than send them a coupon, you’ll need to understand more. If you want to if you want to innovate and communicate effectively with people who are about to bring a child into the world, you need to understand things like: “what kind of an environment they’re hoping to create in their child’s nursery, and why.” You’ll need to understand how they perceive the different brands of furniture you’ll be competing with as they shop and what’s driving those perceptions. You’ll want to understand what’s special and different about your products, and how you can talk about your furniture as something that actually brings greater value to its users. You’ll still need to find insight into the consumer need your brand and product can satisfy better than anyone else.